Ray Chambers is a philanthropist and humanitarian who has directed most of his efforts towards at-risk youth. He is the founding Chairman of the Points of Light Foundation and co-founder, with Colin Powell, of America’s Promise -- The Alliance for Youth. He also co-founded the National Mentoring Partnership and served as Chairman of The Millennium Promise Alliance. Chambers is the founder and Co-Chairman of Malaria No More, with Peter Chernin, President of News Corporation. He is taking a leave of absence from that role to focus on his appointment as the United Nations Secretary-General’s Special Envoy for Malaria. Chambers has been instrumental in the revitalization of the City of Newark, New Jersey, and was the founding Chairman of the New Jersey Performing Arts Center. 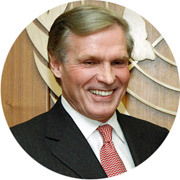 He is a member of the President’s Council on Service and Civic Participation and is the former Chairman of Wesray Capital Corporation, which he co-founded with William E. Simon.Chambers was born in Newark, United States, in 1942.